It’s important to develop good balance if you are to progress and succeed in your dressage riding aspirations. After all, how can you expect your horse to keep his balance in the confines of the arena through transitions and turns if you’re out of balance yourself? 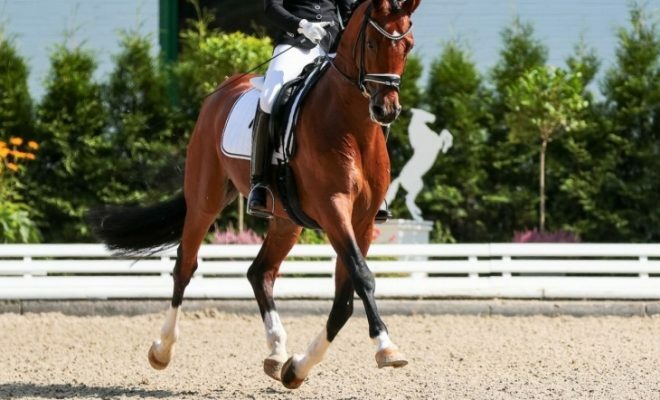 Here are some thoughts on how you can develop your balance and consequently improve your dressage scores. In order to ride in a good balance, you must be relaxed. Tension through your body will cause you to grip with your legs, pushing you up and out of the saddle and causing you to lose your balance. You’ll also find that if you’re tense through your back, you can’t sit deep in the saddle, so you just end up bumping up and down on your horse’s back, instead of following his movement. 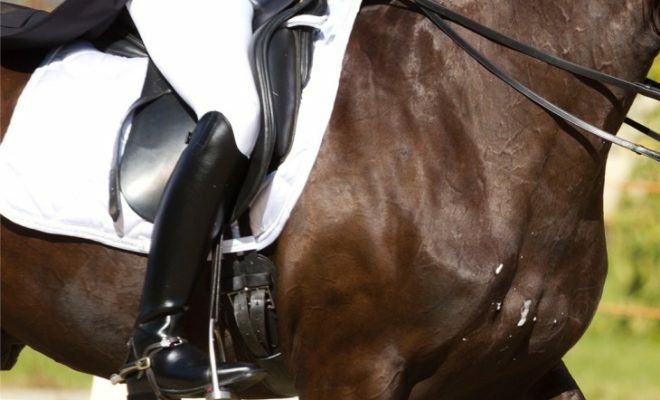 This can not only upset your horse’s own balance, it can cause serious problems with his rhythm and suppleness, losing you many marks over the course of a test. Relaxation should not be confused with sloppy riding; you can’t just slouch in the saddle and expect to sit in a good balance. In order to keep your body balanced and coordinated, you need to have a certain amount of controlled tension in your muscles, without getting tight and stiff. This tension eventually evolves into muscle memory, allowing your body to automatically adjust itself in order to remain in balance with your horse without you having to consciously do anything. 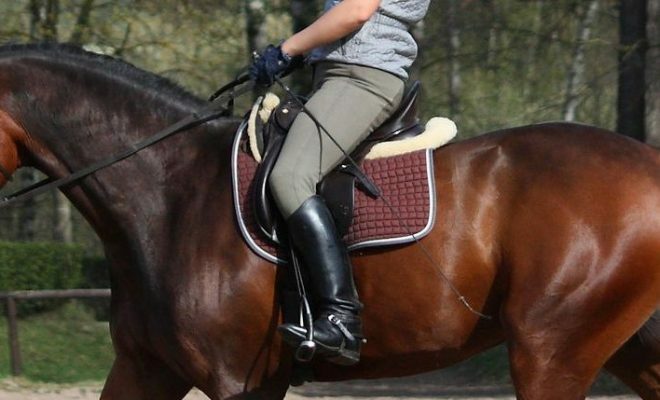 A really good way of improving your balance is to ride without your stirrups. This works best if you can find someone to lunge your horse for you whilst you ride so that you don’t have to worry about steering as well as staying in balance. Place a grab-strap across the ‘D’ rings on the front of your saddle (an old flash strap or spur leather will do for this). 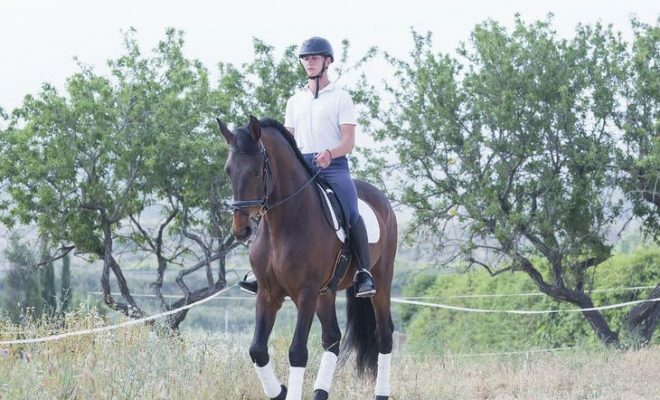 There are lots of exercises that you can practice whilst working without stirrups that will help to develop your muscle memory, which in turn will improve your balance. For this exercise, picture a crouching frog. Draw your knees up as far as you can; this will put you in the deepest part of the saddle. Try to sit there for as long as you can without gripping with your legs. For this exercise, envisage a dog cocking its leg. 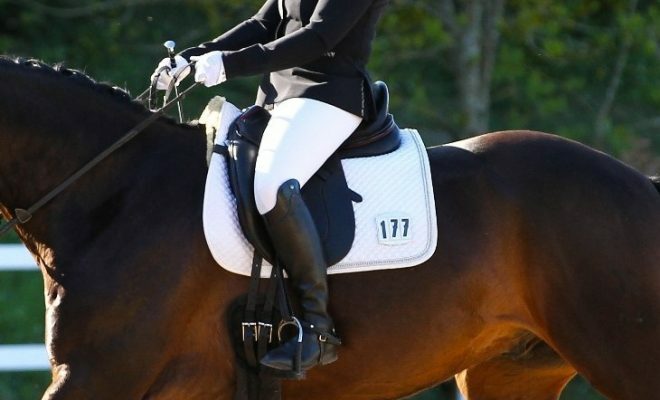 Lift your thighs away from the saddle, so that you can feel your seat settling into the deepest part of the saddle, and maintain this position as your horse walks forward. A really useful exercise for helping to develop ‘feeling’ and balance is to ride around on the lunge with your eyes closed. This helps you to become much more aware of what’s going on underneath you and how your body is reacting to the horse’s movement. 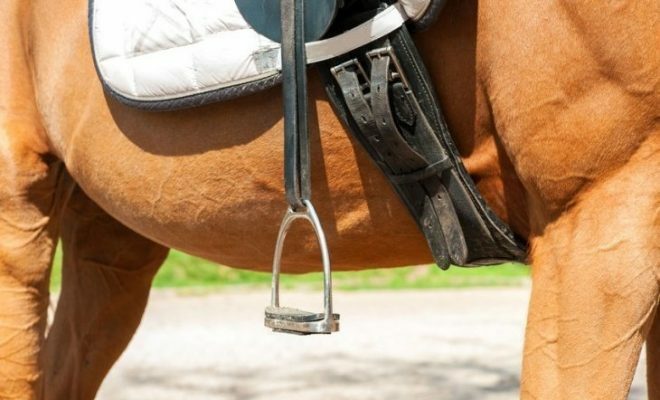 For this exercise, you’ll need to take your stirrups back. In rising trot, try staying up out of the saddle for two beats, sitting for one beat, and then rising for two beats again. This simple exercise causes you to frequently change your diagonal, thus preventing you from using the horse’s action to help your balance. 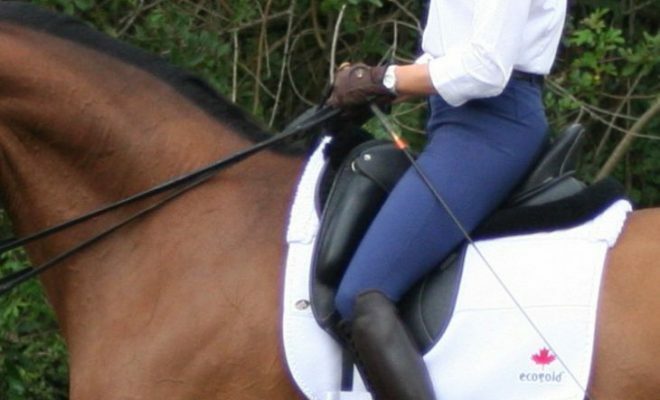 Good balance is essential if you are going to help your horse progress in his dressage career. Try incorporating the exercises suggested above into your weekly training programme and make riding on the lunge without stirrups something you do regularly.